I was upgraded in November from ADSL (Virgin.net - I originally signed up several years back, before cable broadband was available in my area), running at around 4.5Mbps, to the 50Mbps cable service. There are multiple devices in the household, so this was a and very welcome boost. The engineer actually arrived early on the due day (he'd had a cancellation) and was efficient and tidy installing the cabling. The sign-up process was not quite as smooth though. Provisioning the modem went fine, but when I went to select my email address things went less well. To begin with, you cannot have an underscore "_" in the email address, even though it's a perfectly legal character according to the RFC standards. Why? Second, there is nothing to warn you that, although you can have a dot "." in your email address, if you do, you then cannot use this when setting up your webspace URL. (This is odd, since I had one in my virgin.net email address and that was also perfectly OK for the webspace URL). Thirdly, after having had 3 goes at trying email addresses that the system didn't like, it then "gave" me an address - with a dot in it - and a trailing numeral, which is not what I wanted. Despite the assurances by the engineer that I could call customer services afterwards and they'd change it, when I did call I was told that changing the primary address is impossible. Great. So I then had to set-up another email address (wasting one of the 10 allowed), that I could use as both an email address and was acceptable for the webspace URL. a) The speed of the service is excellent. I got the upstream upgrade to 5Mbps soon after installation and that is great when I access my PC's remotely and for uploading to my webspace. b) The hardware install was efficient and quick, although the engineer was not aware of the impending upstream speed increase, when I mentioned it. c) The email configuration process let's you down. It has some kinks in that need sorting out and it should be pointed out during set-up that the primary address cannot be changed and should not contain a dot if you want to be able to use it with webspace. I'm using my own WNDR3700 router and this combined with the 50Mbps service is excellent. Shame about the intial email setup though. There's a few issues in here - hopefully I've answered them all in order! 2. The Virgin Net format for webspace was (if I remember rightly) http://freespace.virgin.net/address whereas in the virginmedia.com world it's http://www.address.webspace.virginmedia.com and the full stop is a separator in DNS and hence not a valid character to be used. However, it should be clear within the signup process - I'll pass this onto the product manager to pickup, although webspace is now largely considered to be a legacy product. 3. We can get someone to look into changing your primary address if needed - suggest dropping the Twitter 'tweam' a line (twitter @ virginmedia.co.uk) with some details. 4. We're working on some improvements to improve the portability of e-mail addresses when changing products - which should make life a bit easier in the scenario you outline above. 2) You are correct re the URL formats, but again, it's an inconsistency (understandable, perhaps, given that they were two separate organisations, until the merger). 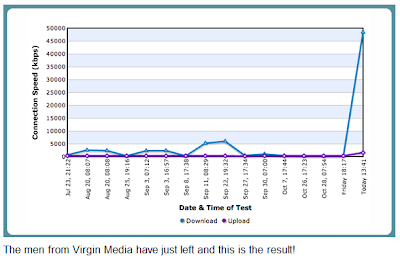 4) I'd already worked out that I wouldn't be able to move my virgin.net email address as the upgrade to allow it is on hold and all the local parts of the various email addresses have been "reserved" for the virginmedia.com domain, but are currently locked. interested in your comment re "webspace is now largely considered to be a legacy product". In your experience, have people given up having their own websites then, or do they use other hosting organisations or their own home-server instead of their ISP? Underscores are definitely invalid on the Google Apps platform - I sponsored the project for some time and remember the conversations in some depth (lucky me). The 'moving' (well, not always moving house but the best way to tackle this is as part of those improvements) process improvements will help the portability of e-mail addresses. As for webspace, it's not that important a service to most customers now - and for those who it is (as you suggest yourself) they tend to make their own arrangements elsewhere. Our focus is more on services like backup & storage nowadays as well as security etc. As for backup, why would I allow my documents and data to be stored on the web by a third party using a service I have little control over and which may be terminated at any time? I'd much rather (and do) backup my data to local media. Again though, this is "off-topic", so I'll leave it there! On the Google stuff, I'd point you at the research we've done that shows it's overall way more popular, but aware we've had some issues that we've been working through - and that them affecting customers has not been good (and apols for that). Thinking about backup, I guess it really depends what your needs are - the service has been popular for the needs of the customers that it serves, but will be even better when all the current improvements in flight are fully released. Having established that my new 50Mbps cable service was up and running, I decided to cancel my old Virgin.net ADSL service (which I'd signed up to years ago, before cable BB came to my area). So I called Virgin Customer Services last Thursday and a really helpful lady took all the details and took care of the cancellation. At my request, she even had a word with the supervisor to make sure that my old email address would keep working for another 14 days, to give me time to tell people and make the change at my bank, energy supplier, etc, etc. Excellent - and I thanked her personally for being so helpful. And then at 8:30 this morning, barely 3 days later... the virgin.net email account stopped working. Great. So I called CS and was passed around between admin and technical departments, who all said it wasn't them, but they'd put me through to someone who could help me. In the end I was told that I needed to talk to the admin people again; the person I was talking to couldn't put me through directly, but if I called 136, a "direct access number", I could take it up with them then. I queried the number, as I'd never come across it before, but it was repeated, so I thought, "Oh, OK". One last thing... in the last email I got from Virgin.net, it says "We will contact you again via email on your cancellation date to confirm that this has been completed." How do they propose to do that if the email account has been closed! It reminds me of the old PC BIOS POST error message: "Keyboard not found - press F1 to continue". Priceless. Annoying and not good enough - sorry. 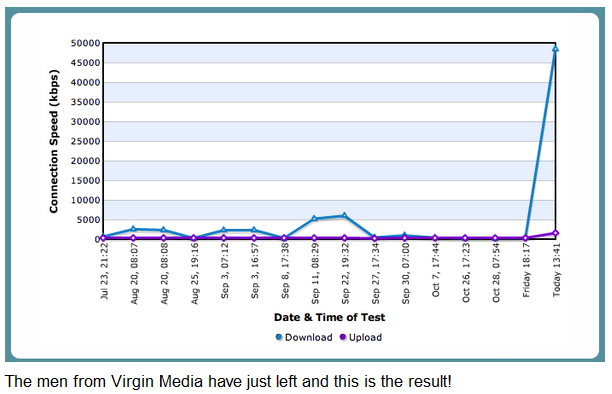 If you can e-mail some info in to the Twitter team (twitter @ virginmedia.co.uk) we can see if we can do anything about this, but it's going to be the house move improvement project being delivered which will sort these things in the longer term. We're moving ahead with that as quickly as we can. Sent an email to the Twitter team, so we'll see what happens. 1) When they know less than you do about their own system/service. Always a bad start. 2) When they play "pass the punter" with you. If I've called the number given on the website or in an email, I expect to have someone take responsibility for my problem and not pass me around like a disease they don't want to catch. 3) When you call to report a fault (be it TV, broadband or phone) only to be told in a disbelieving tone "We are not aware of any problems". Doh! That's why I'm calling! Years ago, I was told that the first rule of training is to establish the level of knowledge of the trainee and treat them accordingly. That should equally apply to Customer Service!